Ideal for both new pool construction or for the renovation of an existing pool tank, Chester's Aquabond™ membrane pool tank liner system will visually enhance your pool while significantly reducing maintenance and upkeep. 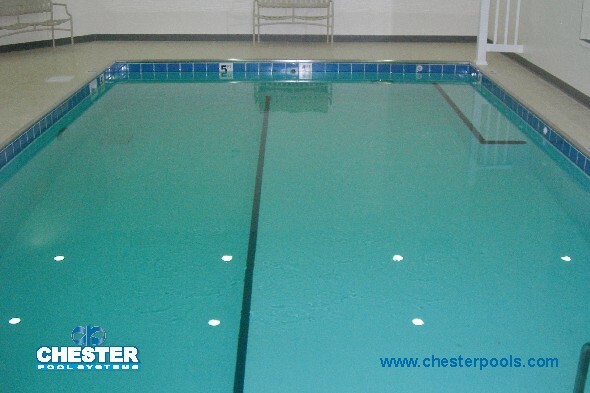 Chester's Aquabond Membrane Liner system covers the interior surfaces of the pool tank with a smooth, non-porous, 60 mil, reinforced PVC membrane that is watertight, impervious to water-borne chemicals, and unaffected by by pool tank thermal expansion and contraction. 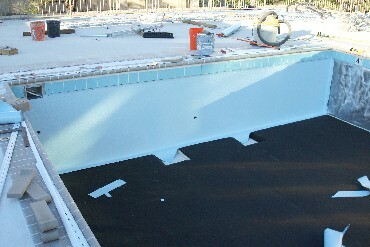 This custom fitted liner may be installed over any pool tank material. The chemically neutral membrane material does not interact with the pool water and consequently does not alter the pool water chemistry, unlike typical porous pool tank surface materials, saving you maintenance time and expense. Pool cleaning is significantly faster and easier as a result of the smooth, non-porous nature of the Aquabond™ membrane, which contributes to the prevention of the growth of bacteria and algae. Annual pool surface maintenance is significantly reduced or eliminated. No need for patching, caulking, recoating, sandblasting, or other costly, time-consuming maintenance. Bring new life to an existing pool - for operators of existing pools, Chester's Aquabond™ Membrane Liner system is an ideal solution for renovating pool tanks with pool tank coating or integrity problems. The liner membrane may be installed over all types of tank materials. Even pools with serious problems are eligible for restoration, as the existing pool walls and structure are only used as support for the new Aquabond™ membrane. Expensive tank reconstruction can be eliminated as the Aquabond™ watertight membrane easily spans pool tank cracks, joints, or other pool tank defects. 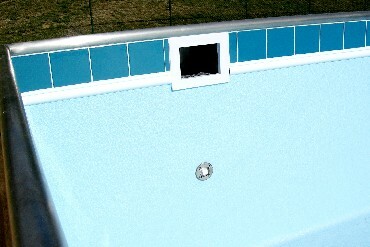 Aquabond liners are custom fitted and installed, precisely matching the pool tank shape. Unlike applied surface coatings, installation is not restricted by temperature extremes, and can be accomplished any time during the year, allowing off-season renovation. 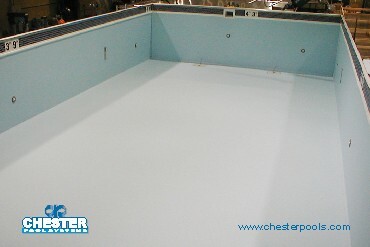 Call a Chester pool expert at (800)248-5486 for more details on the Chester Aquabond™ Liner System. Learn what it can do for your pool facility.